Less than 40 miles east-northeast from where we have stopped for a late lunch, a 3000-foot cliff casts a shadow over the Yosemite Valley. The gale force winds blowing over the top of our snow shelter perched just below the summit of Hamil Bowl at 10,500 feet in the Eastern Sierra are a stark contrast to the concurrent beautiful spring day over in the valley. Birds are chirping, Yosemite Falls is swollen with the spring melt from an overwhelming winter snowpack, and mule deer are grazing in a meadow below daunting El Capitan—a granite wall famous worldwide for its ability to inspire the impossible. Our party of 17, however, is not basking in the sunlight of this imagined serenity and there are no birds or wildlife—any life, really—to speak of within sight. We are in the belly of a bowl high in the Eastern Sierra alpine, watching our major objectives of the day disappear into the increasing cloud cover of a mid-May blizzard, all the while enjoying each other’s company and treats from Mimi’s Cookie Bar in Mammoth. We’ve all made the choice to be here, in this frozen place, together. The journey to this snack party in the sky began with an invitation to Amusement MTN that came in the form of an email last fall sent by a powerful mountain woman who has been working hard to open the door for upcoming riders with their eyes on big mountain lines, Kimmy Fasani. 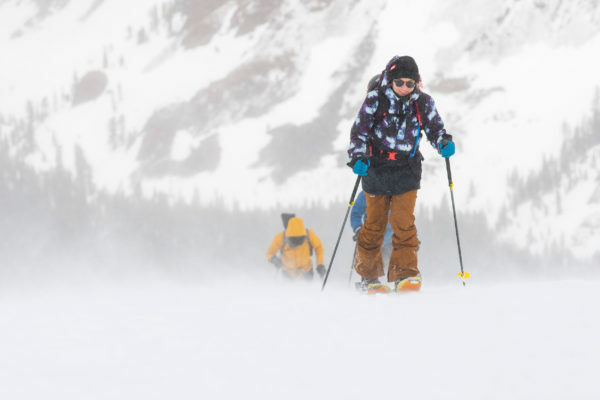 For those new to the backcountry, an American Institute for Avalanche Research and Education avalanche class was in order, a three-day course in snow safety and backcountry rescue open to anyone looking for more knowledge. At the end of the third day, participants receive an AIARE Avy 1 certification, meaning they now have an idea of how much they do not know. For the mentors and other participants more experienced with backcountry travel, the invitation is an opportunity to not only spend time with an amazing crew of like-minded snowboarders but a chance to share the knowledge we have gained through our own experiences. There is a lifetime of learning to be done in the mountains, and by working together we are starting to create an informal version of open-source snowboarding, seemingly shortening the learning curve and making the backcountry a more inviting space while keeping safety and education number one. The end goal is to make each one of us into a reliable member of any crew venturing into the backcountry, capable of making important decisions and confident enough to speak up when others don’t. Amusement MTN is a unique event for an array of reasons. Not often do you see snowboarders from such varying disciplines—Olympians and video part riders, X-Games medalists and splitboard mountaineers, pioneers of freestyle snowboarding and rookies making their mark—gathered together. Together, this crew becomes a stream of colors ebbing and flowing up a mountain by foot power. The basic format of the event creates an environment that brings together those in attendance, working as one to create a rhythmic soundtrack of gliding as bindings click heel-risers and faint labored breaths are heard amid bouts of laugher and spontaneous song. We are brought together in the absence of modern distractions, closer to the mountains we are exploring, as we become in tune with the environment and the people that surround us. With this stage set we are better able to share our experiences, our knowledge, and collaborate both during and outside of the event with others to realize our true potential as both snowboarders and ambassadors of the mountains. For as long as humans have existed under the shadows of the great walls in Yosemite Valley, it was certain that any attempt at climbing the vertical rock would result in failure with a likely side of death. It wasn’t until 1957 that the smaller of the two walls saw its first ascent, over a five-day period. Even with that success, all but Warren Harding, a diehard rock climber with a penchant for alcohol and the impossible, were certain that the tallest wall—El Capitan—would remain unclimbed. Using tactics never seen before in the Valley, Harding and a team of dedicated misfits proved the world wrong after 18 months when they topped out on the 3000-foot precipice. It was possible. It may have taken a year-and-a-half, but the moment they stepped out of the vertical world and onto the summit of El Capitan the impossible suddenly became possible. Modern day climbers, with a fraction of the gear used back then, have been clocked from bottom to top at two-and-a-half hours. In 60 years, the time to scale this vertical granite wall went from impossible to 18 months to 190 minutes. I share this geographically convenient history lesson as testament to the incredible power of possibility. To know that something is already possible creates room for improvement, room for progression and evolution. As pioneers tick off NBDs it is important for those coming up to understand what has been done so that they may improve upon it. A quick online search for TB3: Coming Down the Mountain will take you to a full version of the 1993 snowboard flick by Standard Films. Alongside Jamie Lynn, Noah Salasnek, and Peter Line you can find Victoria Jealouse and Morgan Lafonte ripping AK lines—big lines, in Alaska, in 1993. Amusement MTN isn’t reinventing the wheel but rather keeping it turning, more rapidly and more efficiently. 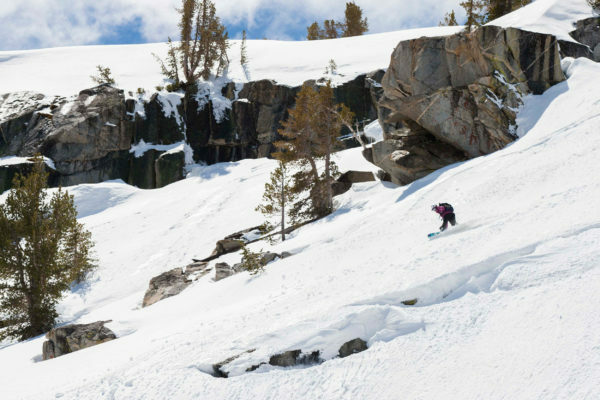 Women have been in the backcountry for decades: Barrett Christy, Janna Meyen, Tara Dakides, Annie Boulanger, Marie-France Roy, Hana Beaman, Jess Kimura, and Leanne Pelosi—legends of snowboarding all with years logged out in the backcountry. From lines in Whistler, to the Baker Road Gap, to stomach-churning descents in Alaska, they have been there. And not only have they been there, they know how to be there because they took the time to figure it out. You don’t simply walk out the boundary gate and succeed. The greatest success in the backcountry is returning at the end of the day with the crew you went in with in the morning. Can you use your beacon, shovel and probe effectively? Did you read the avy forcast? What is the weather supposed to be like this afternoon? Will there be cell service? What’s your emergency plan? What’s your first-aid kit look like, and do you know how to use everything in it? Did you top off your sled with oil? Do you have an extra belt and spark plugs and know how to change both? Can you maneuver your sled up the track to Chocolate Bowl? Is that slope going to slide? How do you manage your sluff in the choke of that chute? Where is your exit point? Are your radios charged? Did you take a photo from below? Can you even find your line from the top with a photo? Where’s your extra pair of gloves and goggles and a dry facemask for the ride out? The laundry list of must-have answers goes on and on. Amusement MTN provides answers to some of these questions but more importantly gives resources to the participants so they know where to look for answers. The event, by design, packs up a previous generation’s worth of knowledge and passes it on. “If I have seen further, it is by standing on the shoulders of giants.” Isaac Newton summarized a concept centuries old even by 1676—to discover truth by building on discoveries of those that came before you. Mentors have been a viable source of education in all types of sport and academic pursuits through the ages. A mentor hands down their lifetime of knowledge in a sometimes neat, sometimes disheveled and cryptic, formula. This package is a living, breathing body of information. 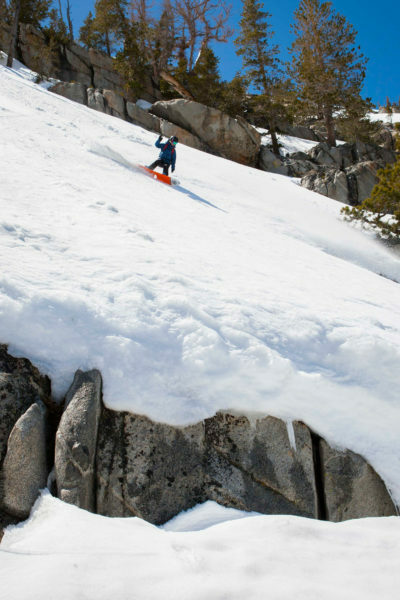 The advent of Amusement MTN seeks to create a place for this within snowboarding to ensure that more women have access to daunting lines, helicopters, big jump builds, whatever is waiting over that convex roll. By spreading knowledge, practicing safety, and educating those close to us we can share in the beauty and power of the mountains while continuing to push the boundaries of the impossible. 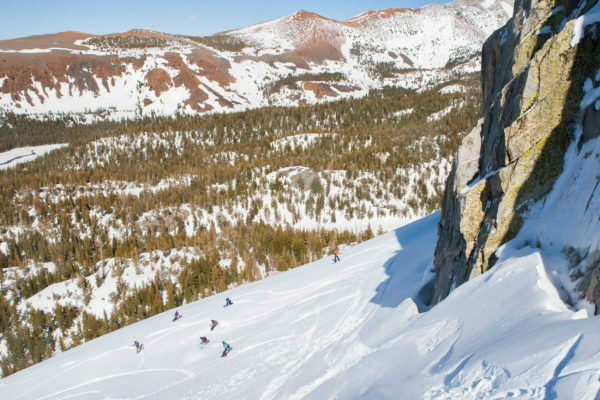 The foundation being built by this event hosted high in California’s Sierra Mountain Range has the potential to be the groundwork for a long-lasting lineage of big mountain explorers. I encourage those with careers that have landed them on faraway Alaskan peaks to look toward the future generation and welcome them with open arms as Kimmy has. I, for one, can’t wait to see what happens in the next ten years.